The first two documents (Getting Started Guide: AWS Web Application Hosting for Linux and Getting Started Guide: AWS Web Application Hosting for Microsoft Windows) are designed to help you create scalable, robust web applications that handle sophisticated demands and workloads using AWS. It provides an example architecture diagram of a web application hosted on AWS and a step-by-step walkthrough of how to deploy your web application using AWS services and follow best practices. The guides walk you through each step of the process. You’ll sign up for the services and install the command-line tools. Then you will create an Elastic Load Balancer, EC2 Security Group, and a Key Pair. 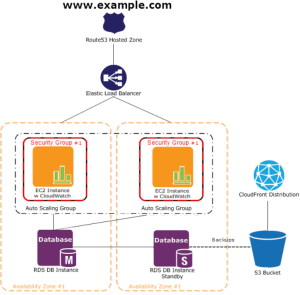 Next, you will use Auto Scaling to launch a load-balanced array of Amazon EC2 instances and set up a CloudWatch alarm to drive the Auto Scaling process. You will add database capabilities by launching an Amazon RDS DB Instance along with the associated DB Security Group. With the infrastructure in place, you will install and launch your web application.Finally, you will use the CloudFormer tool to capture your setup as a reusable CloudFormation template. The guide also covers the use of Route 53 for DNS hosting and CloudFront for content distribution. We also have a brand new Microsoft Windows Guide. This guide contains conceptual information about Amazon EC2, as well as information about how to use the service to create new web applications on Windows instances. Separate sections describe how to program with the command line interface (CLI) and the Query API.